Here is my first effort in Gn15. I found a model car kit on our local version of ebay, which was missing the car shell, so none of the model car people wanted it. But it still had the motor, (plus a lot of other parts I may be able to use), so $4 for the auction and $5 for the postage and it was on my door step . The loco fits on a Tenshodo spud unit. I just need to work out how I can mount the plastic motor and still get to the screw underneath that holds the loco top to the Tenshodo chassis. I also haven't decided if the driver is going to sit side on or face the front. That depends on the layout track plan which is not confirmed yet. A stamping battery for the mine. 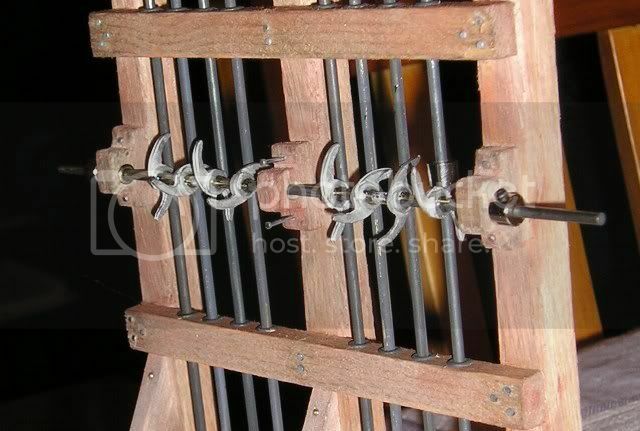 I also have the stamp rods that go up and down, but I took them back out while I finish the wood frame work. Last edited by Glen A on Sun Apr 25, 2010 8:10 am, edited 3 times in total. You should be able to locate a Tenshodo without Gneed for screws for fixing - try Blutac, providing the clearances are reasonably tight it'll hold. Off to a good start Glen . I have a box full of car kit bits that is raided when I want detail bits. 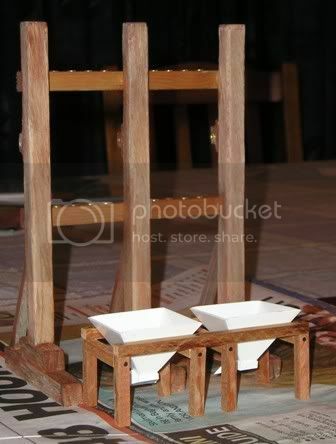 That stamp mill looks very interesting, have had thoughts in that direction myself but have to limit how many minerals that can be mined in 30sq. feet . The stamper looks good. I will watch your progress with interest. For the gears have a look at http://servolink.com/default.asp. I think Northyard are an NZ agent. 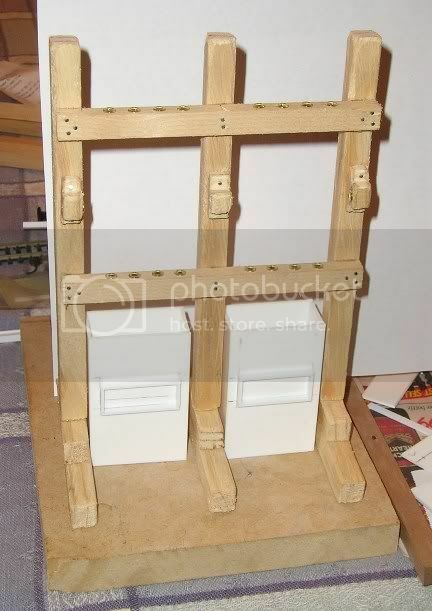 As Gerry said, go for Blutac to attach the Tenshodo Glen, by far the best method and you wont need to get at it from above, leaving yo free to build above the footplate. The stamps look very good, such simple but effective pieces of machinery. Is this any help, the California Stamps at my local Treacle Mine, got to know these quite intimately while restoring them to working order, technology even I could understand . Thanks for the info about the gears, and blutac. Thanks too Steve for that picture. I have printed it out and will use it as a reference for future work. Glen A wrote: Thanks too Steve for that picture. I have printed it out and will use it as a reference for future work. Somewhere I have a whole load of photo's of these stamps, taken during the restoration, but have no idea where they are at the moment. How I wish we had had digital cameras back then . 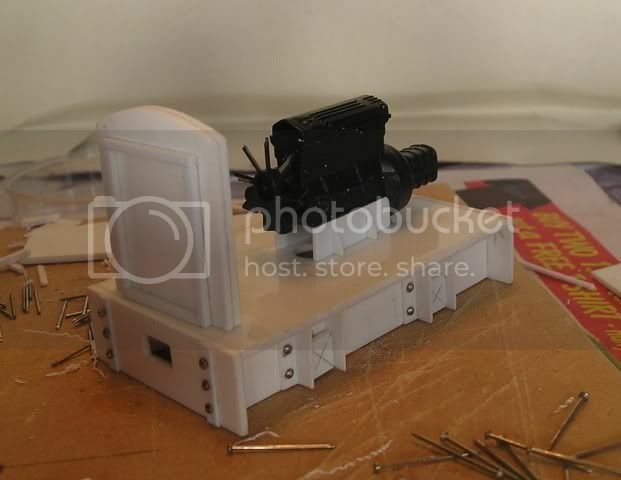 I got some good ideas from seeing the loco "in process. As I am a beginner, that's very helpful. I give new meaning to the term "bash"<g>. What're you like after you warm up? Now I have struck my first problem, (due to fact I am not very good a wethering and don't usually do it ). So far I have put one thin black wash (small amount of black very diluted down with turps). The result is Gnot was I was hoping for; it needs to be a more browny-red wood colour. But maybe I am by chance still heading in the right direction. (the result is not as glossy as it appears in the picture). So what is the recommended course of action next please? Use Acrylics Glen. They don't smell though I'm not going to suggest colours. They tend to vary depending upon Modeller preferences. Often best to try colour combinations on scrap wood first. I also recomend acrylics, also for wood try artists inks or Games Workshop inks (I presume the evil empire has extended as far as the southern hemisphere). A cheep alternative (but not so permament) is a brush nibbed felt pen. As far as colours, start with the lightest and work the darker colours over the top. I was aware there is a prefered order. However the book on Big River lists the order as 1-8-4-10-2-7-5-9-3-6, so I can only assume that it changes when you add a second set of stamps. 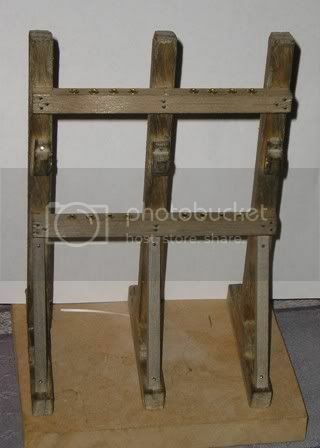 Also made the loading hoppers and frame-work for the back. I also managed to weather the frame back to a colour matching the rest of the wood. (Thanks to Jim and Gerry for your suggestions). I gave it a light sand, then put on lots of water, then a light wash of waterbased red/brown. Hopefully the brass blackner will turn up this week, so I will be able to start assembling the rods and cams, and then I will find out if will actually run. Phil Latterly might be interested in this thread...post him a note. Well, after several days wait, the local gun shop got in the metal blackener that I had ordered. So over the weekend I got the brass rods blackened, and fitted the cams. I drilled a hole in the cams for the main rod. And then drilled a very small hole offset at a different rotation for each one. I threaded a small piece of wire through the smaller hole to act as a key (which you can just see in the photo) to hold them in line. The key wire was soldered on, and the cams were glued in place. Tonight the glue will have hardened, and I will put on the tappets and find out if it all runs. If it works I will put on all the finishing details. If not you will probably never hear of this again, and it will find its way to the back of the shelf. I’m getting close to finishing the build now. I won't be installing the drive wheel and motorising it until the water wheel is done (the next project). 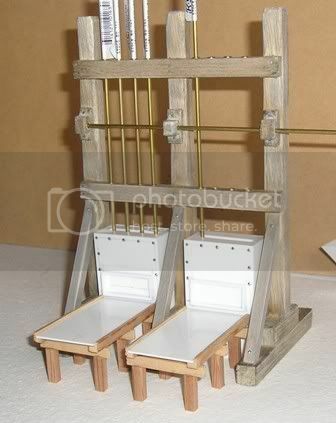 But I have tried turning it by hand and the shafts all go up and down, so it looks like it will run ok.
G,day Glen....It LOOKS right, so it must be right . 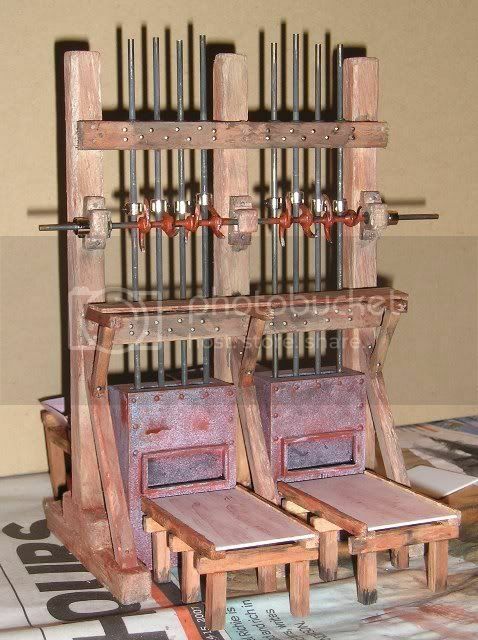 Have seen a number of stamp mills and it looks OK to me, good work. If you like the way it looks and I like the way it looks, and John and Gerry like the way it looks. Then it must be damn near perfect! -------------------Then it must be damn near perfect! 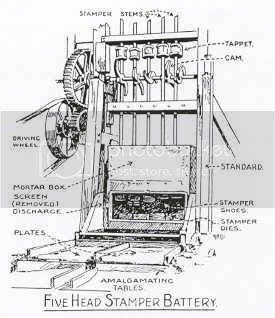 Well next is obviously the water wheel that drives the stamper, and then there is a 'lifting' device (or two), motorised of course. I've started working on them in the background. Can't really do much more until I start the layout to know how high they need to lift. It will be a most inefficient and un-prototypical mine, but hopefully I will have fun running it. I was hoping to have it finished for a train show here in October, but I've left it too late now . Maybe next year.